Difficulty in standing because of a tremor of the muscles or as a result of a lack of coordination. Relating to muscular tremors or involuntary quivering or shaking. A neurotic inability to get up from a sitting postion or to stand up. A recovery or convalescence from a debilitating medical condition or increasing one's health. The doctrine or political position that opposes the withdrawal of the state's recognition of an established church; especially, concerning the Anglican Church in England. 1. A political philosophy that was opposed to the separation of a religious group, or church, and a government or state; especially, the belief held by those in 19th century England who were opposed to separating the Anglican church from the civil government or to refer to the separation of church and state. 2. The word is especially noted for its unusual length of twenty-eight letters and twelve syllables and it is considered to be one of the longest words in the English language. A policy or attitude that views a nation's power structure as corrupt, repressive, exploitive, etc. : "Antiestablishmentarianism involves those who are opposed to the existing social and political structures of their government or society." 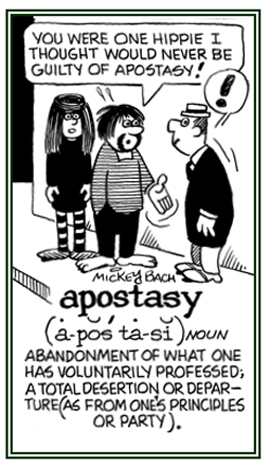 The rejection of or the abandonment of a religious belief, a political party, or certain principles: Jacob's apostasy was a disappointment for his mother because he no longer belonged to the religious organization that he had been a member of ever since he was a child. © ALL rights are reserved. 1. The act of legally taking and keeping someone in custody by the police: Witnesses and the photos taken by the in-store cameras have led to the arrest of four suspects. 2. In medicine, an occurrence in which a part of the body suddenly stops functioning: The patient went into a cardiac arrest. "The local hospital reported an increase in respiratory arrests or instances in which several patients suddenly stopped breathing." 3. Etymology: from Latin ad-, "at, to" + restare, "to remain, to stop". 1. To use the power and authority of the law to take and to keep someone in jail: "The police officer said, 'I'm arresting you in the name of the law.' "
"The police arrested the man for assaulting his wife." 2. To stop the movement of something: "The doctor told the patient that drugs can't arrest the progress of the disease, however, they can slow it down." Showing page 1 out of 22 pages of 319 main-word entries or main-word-entry groups.